A decades-long, multi-party legal fight over what may or may not be uninhabited West Bank land has become an international incident. Khirbet Susiya is an unlikely cause-célèbre. Deep in the South Hebron Hills, this shantytown comprises a few dozen tents, animal pens, and German-donated solar panels. Israel insists it was built illegally and wants to demolish it while offering to rehouse the residents nearby. The Palestinian Authority encourages further construction without permits and in defiance of Israeli court orders. The European Union funds this construction, and together with the U.S. and UN publicly warns Israel to back off. Meanwhile, non-governmental organizations on both Left and Right continue to petition the Israeli Supreme Court and wage an international public relations battle over the fate of the windswept hamlet. How did Israel, the Palestinians, the international community, and an assortment of NGOs reach this unsightly stalemate over an obscure Judean hill? What follows is based on two expeditions to the area—one visit to the Nawajeh clan in Susiya with left-wing activists, and another to the nearby Jewish settlement of Susya with right-wing activists. It is based on conversations with military officials, diplomats, and political advocates, as well as reams of old maps and contemporary court papers. It is an attempt to make sense of Susiya, and to separate rhetoric from reality. Without declaring winners and losers, this is an attempt to evaluate the facts—while leaving readers to draw their own judgments. Khirbet Susiya is located a few kilometers south of the Palestinian city of Yatta, in the West Bank’s Area C (where Israel has full civil and military control). It contains around 170 structures: the homes of 28 families and a cluster of community structures (sometimes higher numbers are cited, including nearby homes in Area B, which is under joint Israeli-Palestinian control). It is wedged between the Jewish settlement of Susya to the southeast, and an archaeological park to the northeast. Thirty years ago, however, there was nothing there. The residents lived in a cluster of caves in what is today the archaeological park, centered on the remains of a 4th-century synagogue—which comprise the most immaculately preserved Jewish ruins anywhere in the Holy Land. The battle over Susiya is, at heart, really a battle over the narrative of the entire Israeli-Palestinian conflict. 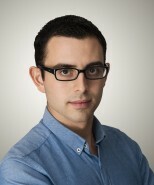 Dr. Yuval Baruch excavated the area in the 1990s for a doctoral thesis on the various stages of construction in Susiya. In a phone conversation, he was adamant that Susiya was entirely empty until the late 19th century at the earliest. Susiya was a Jewish town till the Arab conquest in the 7th century, he says. From then on, it was inhabited by Muslims who were most likely forcibly converted Jews. It was completely abandoned by the 10th century. In the 13th century, a very poor herding community was established atop the ruins, and promptly abandoned it again. Left-wing NGO Emek Shaveh quotes Dr. Baruch as saying that Susiya has been continuously inhabited since the 13th century, but he describes this as “a distorted way to describe history.” To Baruch’s best understanding, as the foremost expert on Susiya’s development, the current inhabitants probably moved there from Yatta during the time the West Bank was ruled by Jordan. Nasser Nawajeh, Susiya’s unofficial spokesman, admits that his grandfather came to the village from Arad in 1948-49 during Israel’s War of Independence. Whatever the pre-history, however, by 1986 the caves at Susiya were inhabited, at least for part of the year, by Arab shepherds. Archaeologist Gidon Sulimani, who participated in the original archeological excavations, describes an “organized and orderly village” of Arabs who resided in caves alongside a dig conducted by Israeli archaeologists immediately after the Six-Day War. He points to surviving signs of habitation in caves not yet restored for visitors, including their division into separate living quarters and soot on the ceiling from cooking. The Israeli Civil Administration (ICA) stated in its expropriation order that the caves were inhabited, as did the government lawyer who proposed the site on which to build Jewish Susya. Geographer David Grossman wrote that 25 families lived in the caves. The settlement movement itself admits the caves were inhabited for several months a year during the grazing season. When describing Susiya as a “village that never was,” they do not deny that people lived there at times, only that the site was not a permanent settlement. For their part, Susiya’s residents admit that there were no houses at the time, only caves. The suggestion in one UN fact sheet that they “used to live in houses” is false (as is the bizarre claim that the archaeological site contains the ruins of a “Roman church” rather than a synagogue). The only question, then, is whether the caves were inhabited permanently or seasonally. Nasser Nawajeh insists that the village was always permanently inhabited, even if most families spent summers in Yatta, but there is no evidence for this. The testimony provided by the settlement movement itself, however, suggests the caves were inhabited for most of the year. 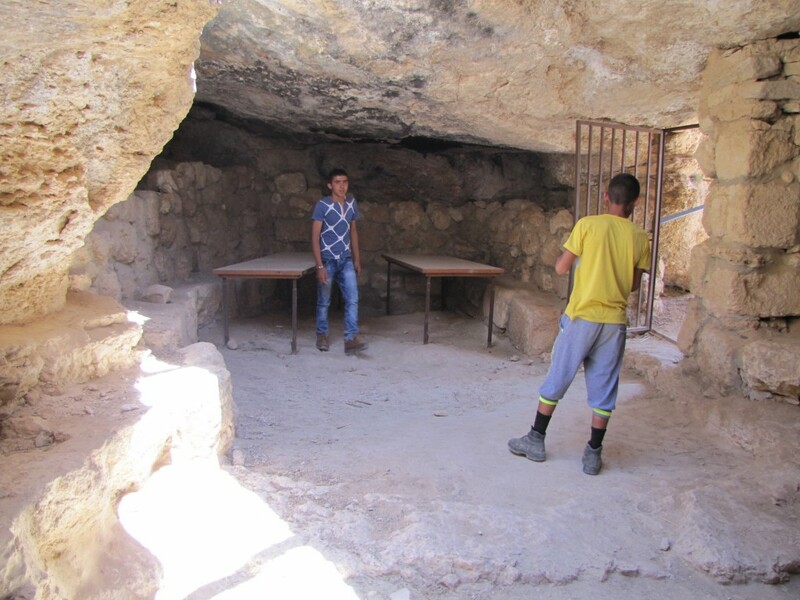 They cite Yaakov Habakuk, who wrote in 1985 that Arab shepherds lived in the caves during the grazing season, which runs from October-November until April-May, meaning the site was inhabited for six to eight months a year. For what it’s worth, left-wing activist Gidon Sulimani dismisses the very notion of “seasonal habitation” as a European prejudice. “These are not seasonal dwellings, but a community and a society that lives across a broad territorial area” that spans the mother village of Yatta and the cave communities, he says. The synagogue is found in a place known as the lands of Khirbet Susiya, and around it is an Arab village among the ancient ruins.…The land of Khirbet Susiya is registered in the land registry, according to which this land—some 3,000 dunams [740 acres]—is under the private ownership of many Arab landowners. It follows that the territory of the area adjacent to the synagogue is, one way or another, privately owned. In the same letter, Albeck identified an alternative site two kilometers southeast—uncultivated, unregistered and apparently state land—which she recommended for the establishment of Jewish Susya. Since the site it proposes for Susya is far from the archaeological site, we can assume that the land in the middle—where the Arab encampment is now—was part of those 3,000 privately-owned dunams. 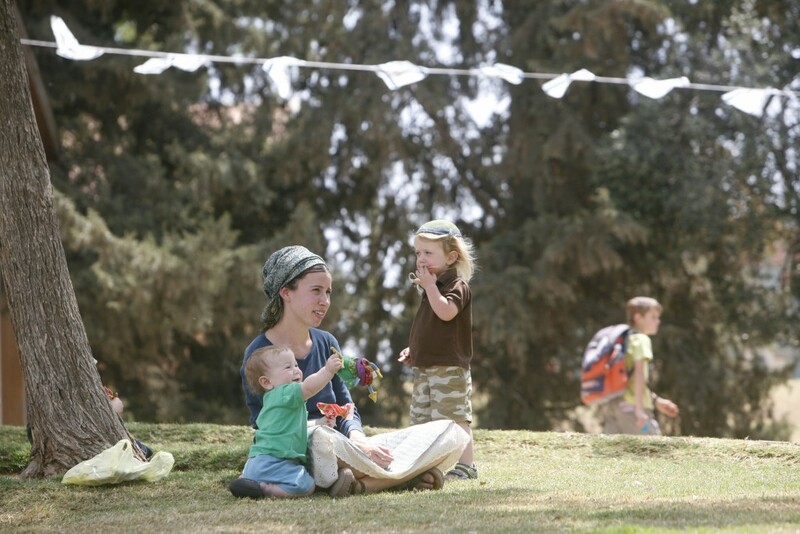 The right-wing NGO Regavim, which campaigns for enforcement against illegal Arab construction, insists that the area is state land because “to date, nobody has proven ownership over the land.” In a column for The Jerusalem Post, Regavim’s Ari Briggs called the residents “squatters illegally trying to grab state lands,” and further claimed that the Supreme Court “upheld Regavim’s claims that these Palestinian Arabs have been … building illegally on state lands.” The court rulings say no such thing. In another column, Briggs referred to the Albeck letter as “documenting some private land in the area and confirmed it as agricultural land only.” Again, this is quite untrue. The most plausible claim made by Regavim is that the land is privately owned but not by the specific people who live there now, because if there were multiple landowners a hundred years ago, there must be hundreds of heirs today. But even if one gives Regavim the benefit of the doubt in regard to its assertion that the Nawajeh clan has not proven ownership, its assertion that their claims are “a complete lie” is something of a leap. Indeed, the ICA is reportedly convinced by the Nawajehs’ claims. According to a July 2015 Haaretz report, a leaked internal opinion by the ICA’s Custodianship Officer upheld the validity of an Ottoman title deed from 1881, and confirmed that it included lands of the Jabor and Nawajeh families. COGAT declined to comment on the question of land ownership when asked for this investigation. In 1986, Israel declared the area an archaeological site and evicted the two-dozen families who lived there. The ICA issued an expropriation order for 277 dunams (68 acres) on September 1, 1986, ordering its officers to instruct community leaders in Yatta within ten days of “the right of the owners to receive compensation for the expropriated lands after they prove ownership.” It even compelled the community leaders to sign a statement that they would inform the residents accordingly. Today, the residents claim that they appealed, but with the outbreak of the first intifada, decided not to pursue it further, as they lacked the support of the phalanx of NGOs that backs them now. The families say they then relocated to nearby caves, erecting “flimsy” shelters and tents. It is unclear, again, to what extent these structures were permanently inhabited or used only during the grazing season, but even Regavim admits there were a few tents in the area in the 1990s. They were established without planning permission, and as a result the Israeli military intermittently demolished them. In July 2001, things changed dramatically: The military demolished the entire village in the wake of the murder of a settler, Yair Har Sinai, which was incorrectly blamed on the Arabs of Susiya. The residents slept by the side of the road. Rabbi Arik Ascherman, a founder of Rabbis for Human Rights, recalls camping out with them together with far-Left activist Ezra Nawi. The residents appealed to the Supreme Court, and two months later, Justice Ayala Procaccia issued a fateful interim order preventing the ICA from demolishing the remaining structures. The residents insisted that this entitled them to rebuild, without planning permission, the structures that were just destroyed, and erected tents to replace the demolished caves. The ICA, however, promptly imposed demolition orders on the new structures, as the interim order explicitly did not apply to any structures erected illegally from that point on. In March 2003, the Court ordered the residents to dismantle the structures they had built in contempt of court, and permitted the state to demolish them, although it urged the state to discuss which illegal structures could stay out of humanitarian concerns. The legal status of Susiya has been contested in the Israeli court system since 2001. A final ruling has been issued, but in the case of Susiya, such rulings often aren’t so final after all. Regavim claims that Susiya is a fiction created over the last decade. It points to two aerial photographs from 1999 and the 2000s, the first showing no discernible buildings and the latter showing a cluster of tents. Susiya, it concludes, never existed until the Palestinians turned it into a weapon against Israel. This claim is patently false. First, if there were no Khirbet Susiya before 2001, then the High Court injunction from 2001 ordering the IDF to cease demolitions would be absurd. Second, the Arabs of Susiya readily admit that before 2001 they lived mostly in caves, which explains why nothing shows up on satellite footage before that date. Over the course of the 2000s, the residents by their own admission continued to build illegally. According to Nasser Nawajeh, construction included both the replacement of previously demolished structures (a point on which the ICA agrees) and the building of new structures to accommodate natural growth. He argues that the construction was undertaken unilaterally because the ICA refused to issue building permits. Israel claims that the village expanded from “a few lone tents” in 2001 to some 100 structures now, which cannot be explained as replacements for the caves in which the residents used to live. In 2011, the story of Susiya shifted gear. Israel began stepping up the enforcement of demolition orders: In 2011, the UN reported four waves of demolitions of a total of 41 structures. Half of the structures in the encampment were now under demolition orders. During this time, unauthorized construction grew dramatically. A family that arrived in Jewish Susya in 2007 was adamant that most of today’s Khirbet Susiya did not exist: “They’re simply plopping down and saying ‘this is mine,’” they told me. At a lookout post, a couple from Susya pointed at buildings they said were totally new—a large concrete structure on a distant hill, they said, had popped up almost overnight. The Arab owner claimed it was a chicken coop; the settlers say it is a planned school. Every year on Independence Day there is a scavenger hunt from the archaeological site to the settlement, and every year the participants noticed the village’s rapid expansion. The figures appear to back up this claim: In 2012, the EU said that there were around 114 structures; four years later, the UN reported 170. The residents responded to the demolitions with a protracted legal battle. In January 2012, the Supreme Court granted the residents’ petition to suspend the demolitions, issuing a temporary injunction. While the Court was examining the ICA’s demolition orders, however, Regavim filed a petition for an interim order against further Arab construction, demanding to know why the state was not implementing its own orders. On June 7, 2012, Chief Justice Asher Grunis granted Regavim’s request for an interim order against construction in Khirbet Susiya because the residents had continued building after the petition was filed. By the autumn of 2012, there were now temporary injunctions against both construction and demolition in Susiya. In December 2012, the Susiya Arabs submitted five alternative master plans—general planning and zoning schemes without which building permits cannot be granted. One of them included treating the archaeological park with its synagogue as a residential area. Around the same time, Regavim complained to the Supreme Court that the Arabs were violating the recent injunction against construction. It claims that 54 of the 64 structures under demolition orders were built in 2011-2013 alone, and a full 33 of them after the June 2012 injunction. Nasser Nawajeh insists these 33 structures were not new, but merely replaced old tents knocked down in a storm. The manager of the archaeological site describes this as a “lie” and Nawajeh as a “big liar.” Nawajeh does freely admit that besides these 33 “reconstructions,” the residents also built three or four other structures. In any case, having ordered a cessation of construction in Susiya, in February 2013 the Court ordered the state to demolish without delay any illegal construction carried out in contempt of court since 2012. The ICA Planning Committee rejected the Arabs’ planning requests in October 2013, claiming there were “no weighty reasons to promote a plan in this place.” Instead, it offered the residents the opportunity to submit an additional plan for an area three kilometers away, closer to Yatta, on state lands. This proposal offered significant potential for development, the ICA said, close to their agricultural lands. On February 2, 2014, Chief Justice Grunis again ordered the state to demolish any buildings erected in violation of the June 2012 injunction. He also invited Susiya residents to submit a new petition in light of the planning developments, ruling that the temporary injunction against the demolition would expire in 90 days. The Court vacated Regavim’s petition in light of a guarantee that the state would prioritize demolishing structures erected in contempt of court. At this point, the residents could not build; the clock was ticking before the renewal of demolitions. 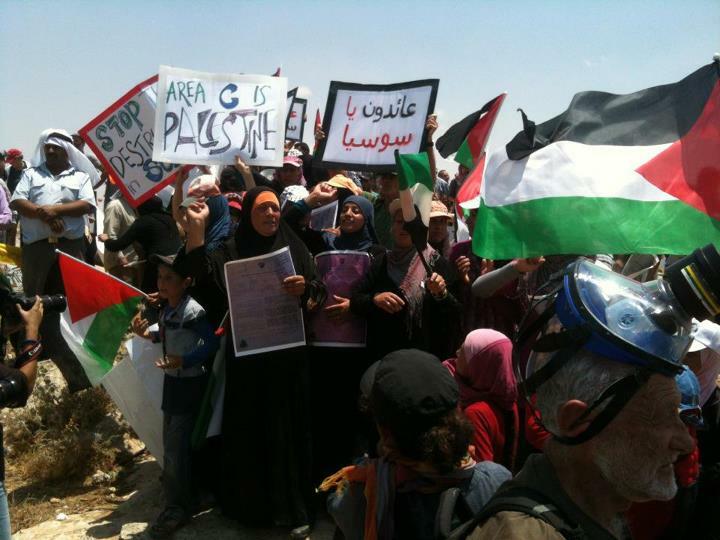 Residents of Khirbet Susiya have repeatedly refused resettlement offers from the State of Israel. Together with Rabbis for Human Rights, the residents filed an urgent petition against the Planning Committee’s decision, describing it as “a paragon of unreasonableness, unfairness, lack of good faith, and cynicism.” Arguing that the residents’ master plan was rejected for arbitrary reasons, they demanded the ICA initiate a new plan at the present site and asked the Court to reinstate the injunction against the 64 planned demolitions. The state refused, retorting that the residents had been exploiting the legal process in order to unilaterally expand. It accused them of a serious lack of integrity, building illegally and then returning to the Court to prevent the demolition of their illegal structures, including those built in contempt of court. As for the alternative housing solution: COGAT declined to comment on the location of the proposed relocation, but the State told the Court in 2014 it was on state lands, which would mean Area C; the residents’ appeal claims that the site they were offered was an “existing residential compound” in Area B. A UN map places the relocation in Jourat al-Jamal, a built-up area in area C. If the UN map is accurate, this would undermine the residents’ claims that Israel wants to expel them from Area C, although a B’Tselem map places Jourat al-Jamal in Areas A and B. Nasser Nawajeh told me it was “on the border of Area B and C” and claimed the land was already owned by another clan, and moving there would spark a violent feud. In any case, the residents feel that they must remain on the agricultural land to prevent it being taken over by settlers. The residents refused the relocation offer. According to one senior military official, the proposed relocation would have provided an adequate and “creative” solution to the residents’ needs if examined on a strictly professional basis. The problem, however, was the question of principle and the “noise”—the pressure on the residents to insist on living on their agricultural land rather than a few minutes away. While sympathetic to the residents’ suspicions that the Israeli authorities could not be trusted to protect their rights over the agricultural land, the official insisted that Israel could have made a public guarantee of the Palestinians’ grazing rights—with international supervision if necessary. The international community, however, vigorously rejected the proposed relocation. “Moving people under occupation without their free and informed consent runs counter to international law,” insisted Robert Piper, the UN’s resident humanitarian coordinator. Left-wing NGOs claim that the proposed demolitions would leave the residents homeless. Rabbis for Human Rights claims that the “state wishes…to throw the residents into the desert” or alternatively “expel its residents…to Area A,” which is under full Palestinian control. This claim is fairly dubious, and not least because of the proposed plan for alternative housing nearby. Indeed, Rabbi Ascherman told me that, personally, he didn’t think it was wise to use the claim that the residents would be left homeless. 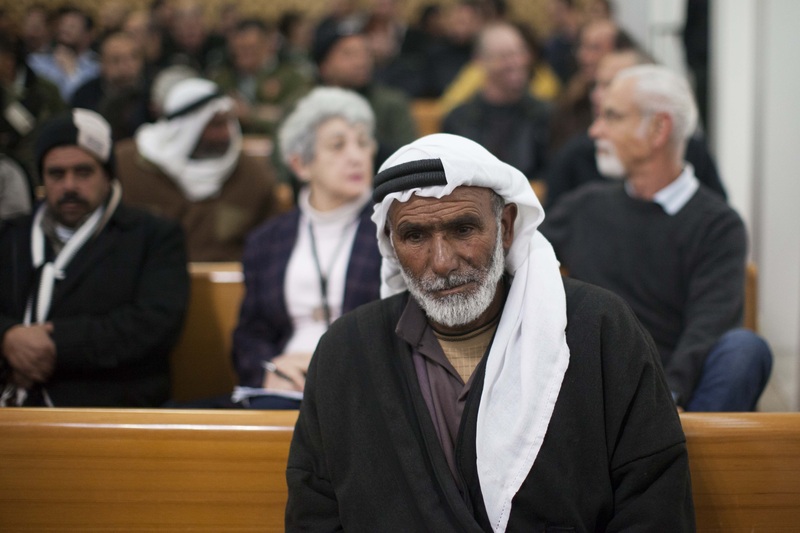 On May 4, 2015, the Supreme Court finally rejected the Arabs’ request for a renewed interim order against the demolition, citing their continued construction in defiance of earlier orders. “On the background of the rulings…in previous litigation…and taking the law into their own hands even after submitting this petition,” wrote Justice Noam Sohlberg, “there is no grounds to grant an interim order.” The state was now obligated to enforce its demolition orders with no alternative housing solution in place for the residents. Israel did not demolish the structures, because by now Susiya was gaining global attention. In June 2015, all 28 Jerusalem consuls of the European Union paid a solidarity visit to the site. The following month, U.S. State Department spokesman John Kirby “strongly urged” Israel to refrain from executing the court-ordered demolitions, urging it to work with the residents to finalize a plan that addresses their needs. The UN’s Robert Piper also visited with senior European officials. “The international community cannot stand by and witness these acts in silence,” he warned, calling on Israel to suspend all demolitions. The UN maintains that it would be illegal for Israel to demolish Susiya. “Under international law, destruction of private property in an occupied territory is forbidden unless absolutely necessary for military reasons, which is patently not the case in Susiya,” Piper explained. Moreover, both the UN and EU reject the idea that they are “promoting construction” in Susiya, claiming that they are “simply providing emergency relief.” A spokesman for the EU Mission in Israel explained that “Israel, as the occupying power, has the obligation to agree to relief schemes and facilitate them by all means at its disposal,” adding that the funding of “non-permanent structures at the point of need” constitutes “basic humanitarian relief.” The EU is reportedly considering a demand for damages due to the demolitions. Israel takes a very different view. The establishment of homes and communal structures requires Israel’s approval as the recognized civil authority in Area C under the Oslo Accords (to which the EU is a signatory). It insists that it is perfectly within its rights to forbid construction on private land. It also rejects the claim that the prohibition in the Fourth Geneva Convention on destroying property covers legitimate enforcement against illegal construction. COGAT has dismissed allegations that Israel does not provide for Palestinian housing in Area C. Since August, COGAT says, the ICA has authorized five master plans to retroactively legalize illegal Arab construction in the town of Qalqilya, and to expand four other Area C villages. It also points to an array of projects it authorized in cooperation with international actors, including football fields, parks, an industrial estate near Nablus, and an “economic corridor” between Jericho and Jordan. Indeed, the Coordinator of Government Activities in the Territories, Maj.-Gen. Yoav Mordechai, was adamant about conducting a dialogue with the Susiya residents in order to achieve a voluntary relocation (during which small-scale demolitions reportedly continued). In recent years, the ICA has been advancing 12 plans to provide adequate housing and infrastructure nearby for Bedouin communities living in similar shantytowns in the E1 area near Maale Adumim, including those the state believes are living there illegally. The residents in question are refusing to accept voluntary relocation to nearby plots. COGAT declined to comment on the substance of the negotiations with the Nawajeh clan, but the proposal appears to be along similar lines: Voluntary relocation to a less politically explosive site in exchange for state-provided housing and infrastructure. In July 2016, these talks were suspended without result in order to allow incoming Defense Minister Avigdor Liberman to determine his own position on the demolitions. The state was then given an extension until November to decide whether the talks would resume, and whether it would agree to give advance notice before performing the demolition. To date, the state has failed to update the Court. And so everyone waits. What began with the eviction of two dozen families of seasonal residents in 1986 has now morphed through decades of unauthorized construction and demolitions into a full-blown crisis between Israel and the international community. At stake in this protracted dispute is not just the fate of Khirbet Susiya itself, but the terms on which the Israeli-Palestinian conflict is to be resolved: It is an attempt to establish facts on the ground, thereby showing who is in charge. If Arab Susiya continues to grow, it severs the geographical connection between Jewish Susya and the nearby archeological site: between the settlement movement and its historic raison d’être of reclaiming the Jewish connection to the land. It will invariably influence any future political agreement. That’s precisely why Regavim believes the Palestinian Authority is promoting construction there. But if it is demolished, Israel proves that pending such an agreement, it remains in full control. It is also a battle over the narrative of the entire conflict. If Arab Susiya is an ancient village, and Israel wants to exile the residents to homelessness in Area B, the picture emerges of Israel as cruelly hell-bent on dispossessing the Palestinians. But if Arab Susiya sprung up almost overnight as a squatters’ encampment on state land, the picture is of a plot by the Palestinians and the international community to deliberately undermine, subvert and delegitimize Israel’s administration of the West Bank in an attempt to prejudge negotiations. So what awaits Khirbet Susiya? Israel is required to demolish the structures built in contempt of court, and cannot easily climb down from that tree. Meanwhile the Palestinians will not countenance losing an international stand-off against the IDF. The international community backs them. But now, with the court-ordered demolition of the Jewish outpost of Amona looming, Peace Now’s Lior Amichai warns that Israel could leverage Susiya’s high profile to prove to the settler-Right that it enforces demolition orders against illegal Arab construction too: The demolition of Susiya “could be part of the State’s ‘price tag’ for Amona.” Indeed, in this context, Prime Minister Benjamin Netanyahu recently vowed to crack down on illegal Arab construction inside sovereign Israel.